NF Railway has planted 5,33,300 plant saplings within its areas during 2017-18 year as part of its continuous commitment towards a greener, safer and more sustainable environment. 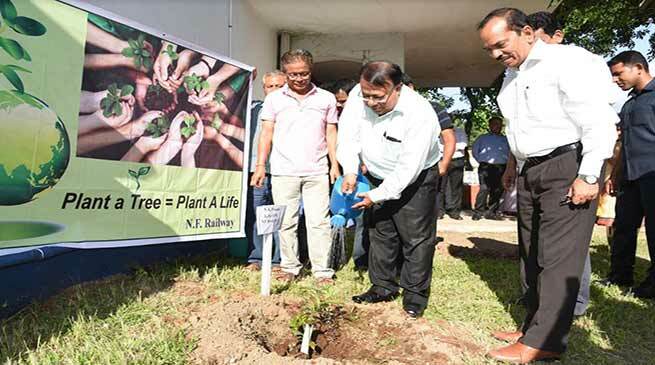 The saplings were planted along railway tracks, around office buildings, in stations, residential colonies, schools, workshops and various parks maintained by railways. The NF Railway has also maintained these saplings and the survival rate is quite high. Although Railway is one of the most non-polluting transportation means, the Indian Railway understand its responsibilities for positive contribution for preserving the environment for our future generation. In that direction, Indian Railway has taken a conscious decision to reduce its carbon footprint by reducing energy consumption. Towards that end, NF Railway has started harnessing of solar power and replacement of traditional lighting with LED lights. Already each of the stations in Northeast Frontier Railway has been provided with 100% LED-lighting. In a remarkable achievement, Guwahati station has been made the first railway station in Northeast to be fully powered with grid connected Solar Power with commissioning of a 700 KWp solar plant. Already, roof mounted solar panels in various office and station buildings in Northeast are generating 1258 KWp of Solar Power which enabled savings of 15 lakh units of electricity and Rs. 1.25 crore of annual energy bills. For conservation of the environment, a total of 6210 environment-friendly, zero-discharge bio-toilets have been fitted in 1730 coaches. By the end of this year 5463 more coaches will be fitted with bio-toilets thereby ensuring that all trains in Northeast are fitted with discharge-free toilets. Already, the 81-km Chaparmukh – Silghat Town section has been converted into a discharge-free Green Corridor in August, 2017.